Remittances from international migrants are a crucial component of the economy of the Philippines and a vital resource for many households, increasingly so as the prices of basic commodities skyrocket as a result of the current global financial crisis. The latter also affects Italy, a main destination for Filipino migrants, with declining demand for workers in domestic and care services where migrants concentrate. The upshot is growing levels of indebtedness among Filipino migrants. Building on the long-standing work of the Filipino Women’s Council, a grassroots migrants’ association, this paper explores the various dimensions of such indebtedness and its root causes. It analyses how limited access to formal financial institutions, responsibilities towards relatives and the combined impacts of economic pressures in both the Philippines and Italy affect migrants’ incomes and the need to borrow. While indebtedness has long been overlooked in debates on migration and development, there is growing evidence that it is a rapidly emerging problem that requires further investigation and appropriate, supportive policies. “It is not a sin to borrow money” (hindi kasalanan ang umutang). This was the statement of a participant in a recent study on Filipino migrant workers who incur debts, which in some cases they find increasingly difficult, and even impossible, to pay. 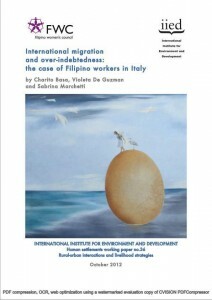 Indeed the study, International migration and over-indebtedness: the case of Filipino workers in Italy – commissioned by the International Institute for Environment and Development, UK – shows that a debt can be a blessing or a curse or just a fact of life that does not define or determine the success of Filipino migrants. However, there are signs that the cases of over-indebtedness have been occurring more frequently since the new millennium. Although over-indebtedness is a condition influenced by the personal traits and conditions of a migrant family, there are just as influential external factors such as the conditions in both sending and receiving countries. 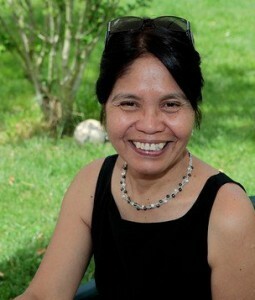 Filipino migrants borrow larger amounts than other migrants in Italy. The majority of loans amount to 10,000 euros or roughly half a million pesos. For some migrants these amounts enable them to invest in land, a home, the education and even migration of other family members, which do help to improve their income and standard of living. At the other extreme are migrants who have to borrow regularly, and even resort to usurers, just to be able to send remittances for the basic needs of their families. Others borrow to cope with occasional but relatively large expenses such as medical emergencies but manage to pay their debts on time, usually by cutting back on expenses. Even before the study, the Filipino Women’s Council (FWC), through years of works and activities with the community in Italy, already observed that the role of migrant workers as principal or even sole breadwinners make them vulnerable to incurring excessive debts. The situation has been exacerbated by the 2007-2008 global crisis and the internal weaknesses of the Philippine economy and governance. The rising costs of living in the country, due mainly to increased food and fuel prices, and the changes in the exchange rate have forced migrants to send more remittances, to the point of using their savings for this purpose. As the study concludes: Borrowing can easily turn into an unwelcome necessity, rather than a strategy to improve the transnational family’s economic standing and help it achieve its long-term goals and dreams. The gains from migration might shrink while the losses may multiply due to forces beyond the migrants’ control, such as the global economic crisis and the nature of Philippine growth, characterized as growth without real increases in both jobs and income. Not even the Filipino migrant’s bayani (hero) mindset and capacity to make sacrifices for family can overcome such problems.